Over 5 million teeth are knocked out in adults and children every single year. 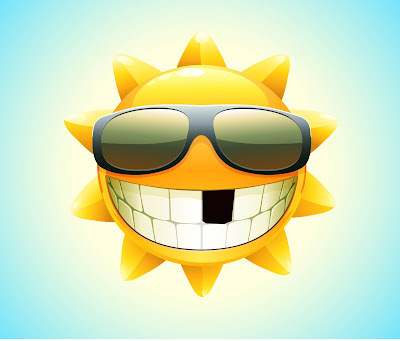 With attention to detail and proper dental care these teeth can potentially be reimplanted and last many years. The most important component in preserving these teeth is time, how fast can you get that tooth back in the mouth is critical in saving a tooth. So how much time do you have? In an ideal scenario 5 minutes. It’s possible to replant a tooth after 60 minutes but the overall success rate is greatly diminished. Really every minute does count so the first 5 minutes is more successful than the next five minutes and so on. So let’s say you’re on the soccer field and somebody crosses the ball and you see it fling and hit your mid fielder right in the face and a big pearly white tooth floats out of his or her mouth. There’s blood, tears and after the initial panic the next logical thing you think of is what are we going to do with this tooth?!? Your first instinct might be to go rinse the tooth with tap water and clean it off, best to go with your first instinct. If you’re comfortable doing it then rinse it under cold water or bottled water for no longer than 10 seconds. If the person who lost the tooth can do it even better. Remember not to scrape the tooth, this is very important. All the proteins and tiny teeth ligaments are integral in giving the tooth a chance to enter back into a stable homeostasis with the body. Sustained pressure is required to push the tooth back into the socket since clotting will have already begun. The tooth needs to be held in place for 5 minutes and don’t worry if the position is not ideal. A dentist can always fine tune the position. If no one at the scene is comfortable replanting the tooth, or if the injured person is unwilling or unable to co-operate, it is possible to store the tooth for delivery to a dentist. Storing in water is a big no–no. The human body thrives in an alkaline environment and because of that if the tooth is placed in water the cells on the surface of the tooth will literally explode because water will diffuse inside the cell membranes. It is best if someone has some Hank Balanced Saline Solution (HBSS) which can be found in some pharmacies to place the tooth into. In the likely event no one has HBSS the next best solution is to have the person whose tooth it is to hold it in their mouth, a great alkaline environment. The last option would be to place the tooth in cold milk. With these three methods the periodontal ligament cells (the tooth’s shock absorber cells) have a chance to survive outside the mouth. Nerve health - Within a few days the pulp will slowly start to disintegrate inside the tooth. The resulting infection can be painful and will slowly destroy the surrounding bone so it’s important to perform a root canal as soon as it’s possible to remove the diseased nerve tissue and seal off the internal portion of the tooth. Age - The jawbone and roots of teeth are all at different levels of maturity throughout the lifetime of the individual and this can impact both success and the type of treatment a dentist may deliver. So why, as mentioned, once you pass that 5 minute threshold does the ability to survive outside the body become less and less favourable? Slowly the body will start to see the reimplanted tooth as a foreign body invader. The more the body doesn’t like the tooth the more likely it will release host factors that can cause the root to resorb resulting in eventual tooth loss. Sometimes it will ankylose the tooth to the bone. Meaning it will cause bone to mineralize around the tooth essentially killing the periodontal cells and fuse bone directly to the tooth surface. Studies have shown that teeth implanted in pre-adolescents typically have shorter survival times than young adults because of the impact of mature roots on completed growth. Primary teeth that have been knocked out are managed differently and should never be reimplanted because they can damage the permanent tooth designated to replace them. The risk to a normal eruption pattern is extremely high when attempting to reimplant a baby tooth. Take a look at the X-ray below and you’ll see why this is the case. 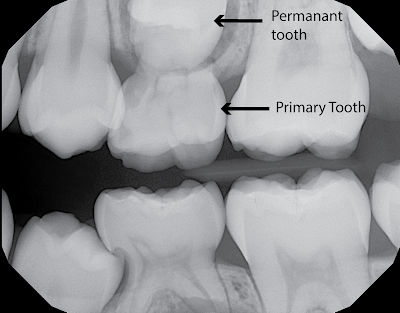 See how the primary tooth intimately sits on the permanent tooth. A permanent tooth is surrounded by a delicate sheath which helps protect it until it erupts. This sheath has the potential to be damaged with reimplantation resulting in a malformed permanent crown. One of the final things a dentist will do after reimplanting a tooth is to splint the reimplanted tooth in place for a period of at least 3 weeks. Buttressing the weaker tooth to the stronger teeth will help to keep the tooth stable while bone forms around the tooth. Over 80% of people say they would not feel comfortable reimplanting a tooth but hopefully this information helps you realize that you might be the difference between saving someone tooth or them losing it forever! 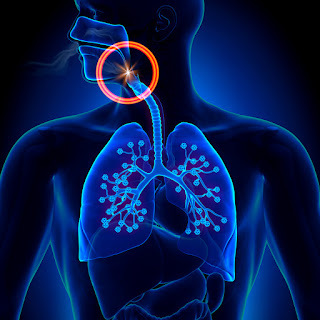 Chances are at one point or another you have heard of sleep apnea (ap-ne-ah). But what is it and how can it affect yourself or someone close to you? 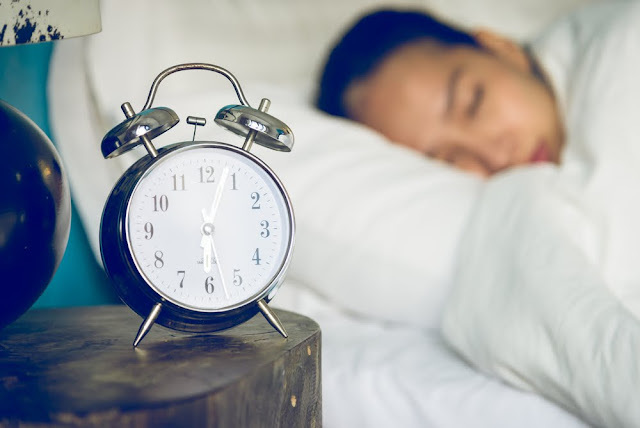 Sleep apnea is becoming much more of a hot button topic these days because it often goes undiagnosed and it can have a significant impact on one's health. Sleep apnea occurs when breathing either stops or becomes excessively shallow during sleep. When this happens the body moves out of deep sleep into a light sleep which consequently means less time for your brain to rest. When your quality of sleep diminishes this can mean daytime sleepiness, difficulty concentrating and overall body lethargy. Family members are often the first to notice sleep apnea because it is a condition that presents itself during sleep. The most common type of sleep apnea is obstructive sleep apnea where the airway is physically blocked and the restricted passage of air results in shallow breathing or pauses. As air tries to squeeze through a tighter and tighter opening snoring results that can often can wake up others in the room. Obstructive sleep apnea is more common in people who are overweight but at the same time we see this in children as well who have large tonsils that restrict the airway. It’s important to realize that sometimes obstructive sleep apnea means a restricted air flow but at times this airflow can be completely stopped meaning no air intake at all. This causes a dangerous overall increase in CO2 levels as O2 levels fall. A second type of sleep apnea is central sleep apnea. If the brain doesn’t send the correct signals to all the the muscles involved in breathing then breathing essentially stops. This type of disorder is more commonly found in people who have certain medical conditions like COPD or use particular medications like oxycodone or morphine. In the short term sleep apnea can affect your day to day functioning but the effects in the long term are significantly more grave. With the extreme stress put on the body it can lead to an increased risk for a number of serious medical conditions including: High blood pressure, strokes, obesity, diabetes, heart failure, arrhythmias and heart attacks. Often I’ll recommend the MRD devices if the sleep apnea is mild to moderate or a patient cannot tolerate a CPAP machine. 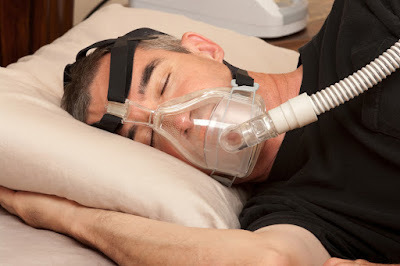 CPAP is most effective non-surgical solution to obstructive sleep apnea and the most widely used but their can be side effects including nightmares or excessive dreaming in early use, dry nose and throat, nasal congestion, irritation of the eyes and throat, abdominal bloating, leaks around the mask and also nosebleeds. Still the benefits out weigh the potential complications because they can be managed or eliminated which is why CPAP’s are so popular. If you think you may have sleep apnea or know someone else who might it's best to mention it to your MD so you can get enrolled in a sleep study to confirm the diagnosis.